we offer accommodation with the tranquility of nature. 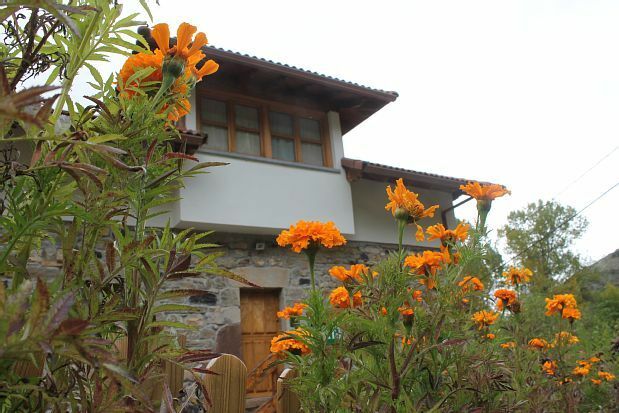 Casa Suso and Casa Teresa are located in Perlunes, in the heart of the Natural Park of Somiedo, Biosphere Reserve, a small town 6 km from the main town Pola de Somiedo, a town that has: supermarket, pharmacy, telecentre and other services . But with many of the advances that the current era offers us: heating, whirlpool, steam shower, fireplace etc. etc ... this could summarize the complex formed by two apartments 2/4 and 4/6 pax rehabilitated from an old farm house, equipping it with the necessary for a comfortable stay, preserving the air and the essence of town. Located in a small population center from where it is still possible to hear from the window or the door of the house the song of the capercaillie, the bellowing of the deer, the howling of the wolf, the curuxa and even noticing the presence of the bear, the natural park of Somiedo, in Asturias, is the Spanish Yellowstone as far as bears are concerned. This enclave, with valleys, peaks, lakes, forests and rivers of extraordinary beauty, is one of the best preserved natural areas in Europe. In CA 'SUSO you can take a steam bath and in CA' TERESA a bubble bath since they have a Steam Shower and a hydromassage bathtub respectively. Finally you can enjoy the common areas where you will find a cozy place to rest; as the social room that has a fireplace, library, mini-bar, games and old discography (Lps) o El corral with terrace, children's area and parking. This apartment is really nice. First of all the setting is really great with spectacular views on the surrounding mountains. Amidst old farmhouses and some stille working, the house offers a very rural setting. The house itself contains everything you need for a nice weekend/week. The bathrooms (2!) are good and clean. It's good to have a jacuzzi after a long day hiking. Last but not leat the owners are nice and talkative folks. Altough my spanish is not that great, I assume they were saying nice things. Me ha encantado pasar unos días en Casa Teresa, es perfecto, me he sentido como en casa, muy limpio, muy equipado, hemos estado muy bien atendidos en todo momento, está situado en un lugar precioso y muy tranquilo y lo de la bañera de hidromasaje un plus adicional para relajarte después de las excursiones. Muy bien por trato muchas gracias ARMIDA,ENGRACIA Y PEPE y por vuestro cariño y la buena cena con tres cachopos diferentes pero espectaculares. Hemos pasado 4 días maravillosos, descubriendo los encantos del Parque Natural de Somiedo, lugar ideal para los amantes de la naturaleza en cualquier época del año. El alojamiento es muy acogedor, muy limpio con muy buena relación calidad-precio. Sus anfitriones han sido estupendos! estando pendientes en todo momento por si necesitábamos cualquier cosa. Estamos seguros de que volveremos!!! Somos David y Paloma, estuvimos 5 días en Perlunes... Naturaleza en estado puro, la casa muy acogedora, rutas a pie con la correspondiente ruta gastronómica, trato del propietario como si fuésemos de la familia (gracias Kiko por dejarnos probar "la mejor fabada del mundo")... Volveremos!!! Sin duda un lugar donde desconectar y estar en armonía con el entorno.